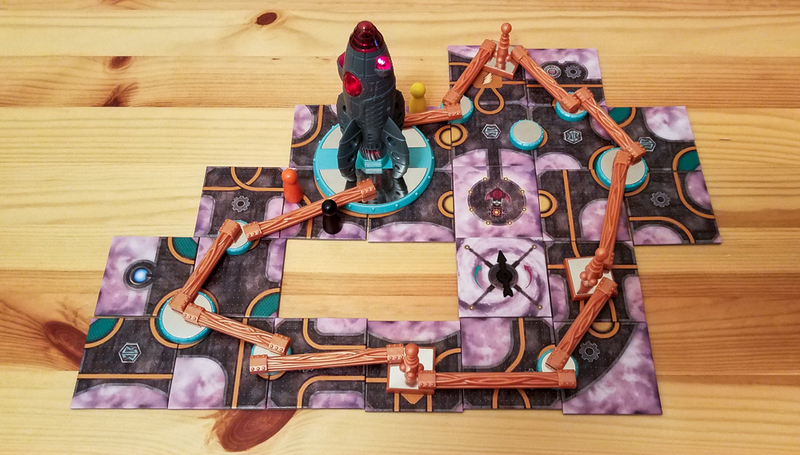 Forbidden Sky is a cooperative tile placement board game from Matt Leacock and Gamewright in which you’re attempting to wire components into a circuit so you can launch a rocket all while dealing with a crazy storm. This is the third game in Matt Leacock’s Forbidden series after Forbidden Island and Forbidden Desert. 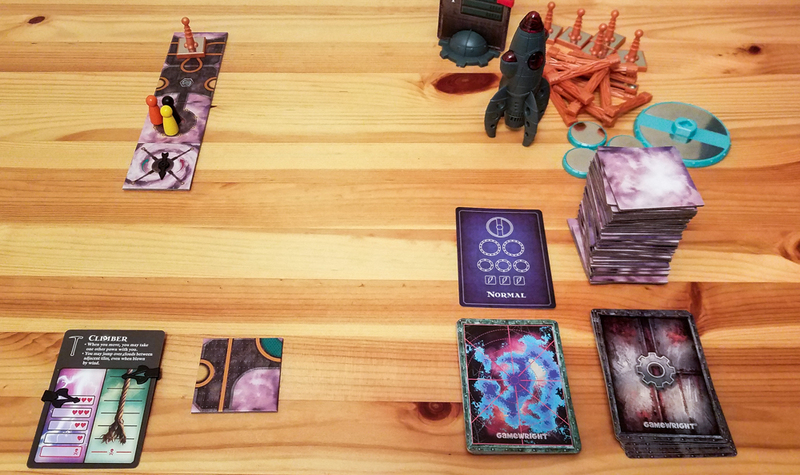 To begin a game of Forbidden Sky, everyone gets an adventurer card that show their unique abilities, a matching adventurer pawn that goes on the starting space, and a starting tile. Everyone will place two clips on their adventurer cards; one for tracking health and one for tracking rope wear. You’ll choose a difficulty level by picking a Blueprint card, which will tell you the minimum amount of components that need to be on the platform and connected in a circuit before you can take off in the rocket. Move – You can move to any adjacent tile that is connected by a platform and you can move between teleporters. Scout – Draw a tile from the stack. You can hold up to three tiles. Explore – Place a tile adjacent to your tile as long as the tile you’re on and the tile you’re placing have at least one connected ground wire. Whenever you place a tile that completes a circle or that has a Lightning Rod symbol on it, you’ll place that component on the platform. Wire – Place one end of a wire on a component on your tile and the other end on another component. You can also remove wires with this action. At the end of each turn, you’ll draw Storm cards equal to the current level on the Storm Meter. If you draw a Lightning Strikes card, lightning hits all of the lightning rods on the board and anyone on one of those tiles or on a tile that has a wire connected to a rod gets struck. High Winds cards push the adventurers in the direction that the compass is pointing, which forces you to use your rope if you’re pushed off of the platform. There are also cards that raise the storm intensity and change the direction of the wind. Some tiles have Teleporter, Gear, Wind Shelter, and/or Faraday Cage symbols on them. Teleporter tiles let you teleport from one tile to another. When you place a Gear tile, you immediately get to draw a Gear card. Wind Shelter tiles protect you from wind and Faraday Cage tiles protect you from lightning. You’ll win the game if you’re able to wire all of the required components into a circuit and everyone is able to make it to one of the four launch pad tiles. You’ll lose if you run out of health or rope, the Storm Meter reaches the crossbones symbol, or if the rocket launches before all of the adventurers are able to reach the launch pad. Every game of Forbidden Sky presents a different set of challenges. There are strengths and weaknesses to each combination of adventurers, you won’t know which tiles you’re going to draw, and that storm will definitely mess you up. The randomness makes thematic sense in this game. There is a real feeling of satisfaction when you’re able to complete the circuit and make the rocket blast off. You have to be constantly working with your teammates to figure out how to place the tiles and when to hide from the storm, so you can expect a collective “Wahooo!” when you’re able to pull off a win. It’s really cool how the two main “enemies” in the game, the lightning and the wind, combine to throw everyone off. You might think you’re safe from the elements only to be moved by the wind and then struck by lightning. 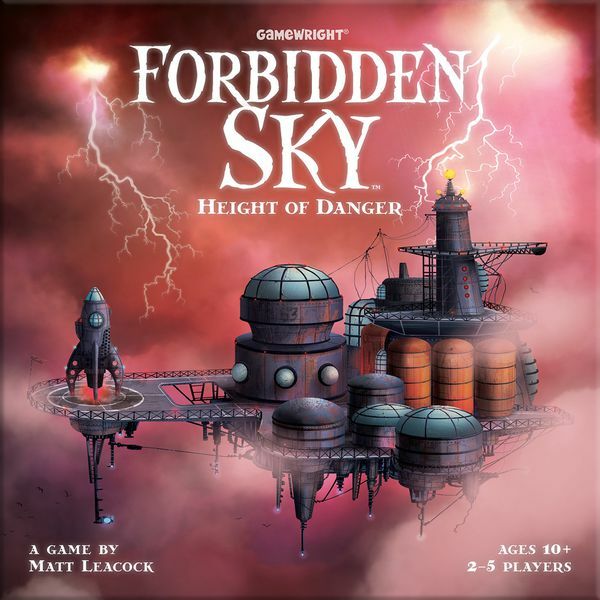 Like Forbidden Desert, Forbidden Sky fits in that “Equally good for new and experienced board gamers” category. It’s easy to learn how to play yet it’s challenging enough for any type of group. The jet “lifting off” when you win was a nice touch. The components slide around quite a bit on the platform, which is pretty frustrating. This happens a lot when you’re trying to connect a second wire to a component, which often results in you dragging another component out of position. After a couple of games we just stopped trying to keep everything positioned correctly. The platform looks pretty strange once you’ve placed about four tiles down. There are incomplete wires everywhere and the edges of the platform often don’t line up. Quarterbacking can be a problem since all of the information is out there for everyone to see. 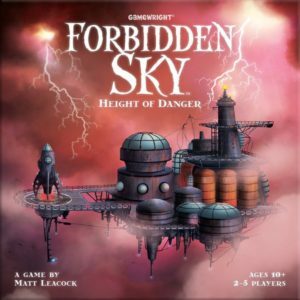 Forbidden Sky is a solid addition to Matt Leacock’s Forbidden series of games. The feel of the game is similar to the other two, but it also has enough differences to make it stand on its own. I’m not a big fan of the overall look of Forbidden Sky, but I definitely do like the way it plays. It’s easy to imagine you’re on this platform frantically trying to wire all of these components together. If you’ve already played and enjoyed Forbidden Island and Forbidden Desert, chances are you will also like Forbidden Sky. If you’re new to the series, I’d recommend the other two over this one, though it really comes down to which theme interests you the most. In my opinion, Island is the best gateway game of the three, Desert is the best “gamer’s game,” and Sky has the most satisfying ending (when you win). Thanks for taking the time to read our Forbidden Sky review! To stay updated on all things cooperative board games, follow us on Twitter, Facebook, or via RSS.